Create a gravatar (I've seen this on a few blogs so am going to check out what it is)--oh, I already have something like this, I just didn't call it a gravatar. So, that was easy. Figure out how to see stats about my blog...anyone have suggestions? Learn how to re-post a post when it's updated, meaning it would show up at the top of my blog, not back where it originally was posted. 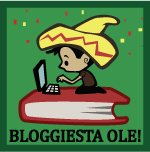 Sign up to participate in the Bloggiesta! Thanks for sharing these fantastic goals for the Bloggiesta! I was very resistant to Twitter in the beginning, but I changed my ways in the last six months or so and have found it to be a really fantastic way to make new connections and grow my blog. Best of luck in 2010! Great work! You've got so many goals and are making such great progress! Great list! Good luck and have fun!